There’s never been anything like it: a spotting scope with such outstanding detail resolution and up to 70x magnification. This even pushes optical tests to their limits. Despite the 95mm objective lens, this is a slim spotting scope weighing in at just 2 kilograms (75 oz). In a nutshell, it ticks all the boxes for any birder wanting to discover an albatross gliding past an oceanic headland. This type of image definition has never been achieved before in any other spotting scope, thanks to the field flattener lenses creating a virtually flat image. Even the finest structures are reproduced with razor-sharp clarity right up to the edge with no need for constant refocusing. The result: every detail is instantly captured, producing a perfect image without any distortions. A highly innovative optics design combined with fluoride containing HD lenses minimise interfering colour fringing. This enables maximum colour fidelity and leads to a significant improvement in resolution and contrast. The result: an even more lifelike, contrast-rich image. Nothing escapes you. You have your eyes trained on a flock of dunlins, but you catch something at the edge of the picture. A rarity? Thanks to their wide field of view, the STX spotting scopes provide you with a broader, more exciting platform for your viewing experience. 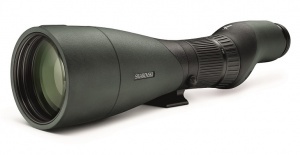 In spite of their high zoom range, the new generation of spotting scopes offers a large field of view. This allows you to achieve optimum magnification and detail recognition and also makes it extremely easy for you to search for and find objects, especially if they are in motion. Large field of view even for spectacle wearers SWAROVISION features a long eye relief and the removable twist-in eyecup is individually adjustable. The result: even spectacle wearers can enjoy a large field of view, not to mention the inimitable edge sharpness. An additional eyecup has been specially developed for spectacle wearers to further increase viewing comfort. The enhanced lens and prism coatings (SWARODUR & SWAROTOP) give noticeably better colour reproduction combined with even greater transmission. SWAROCLEAN coatings on the outer lens surfaces create a non-stick effect, making it easier to clean. The result: even more impressive observing experiences, even in low light. Ingenious System The new modular design offers previously unimagined flexibility and you are free to choose the perfect solution as the situation dictates. In collaboration with experts we have developed digiscoping adapters that open up a new realm of ways in which to observe and share the most beautiful moments. Perfectly designed down to the smallest detail, you will be equipped for any situation. When every second counts. Imagine a plover flitting over the shore one minute and taking off into the sky the next. The STX spotting scopes ensure that you are prepared for moments like this. This is because the new position of the zoom ring, which is now directly behind the focusing ring, makes it easier to handle. It means that you can zoom and focus with one hand, while steering the spotting scopes direction with the other. This completely new ergonomic design offers a crucial benefit for digiscopers in particular. They can now use the camera quickly, easily and accurately with one hand, while the other concentrates on zoom and focus. Not a gram too heavy for top optical performance. Size and weight is the name of the game for all those who like to travel or spend long days in the field. The STX series means that bulky spotting scopes that are difficult to pack and heavy to carry are a thing of the past. The modular design enables you to store the objective and eyepiece modules separately and the smaller dimensions also mean that you can easily and safely store individual modules in your luggage.